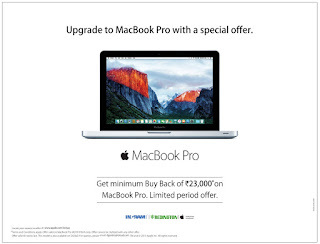 Upgrade to the MACBook Pro with a special offer. MacBook Pro Get minimum Buy back of Rs 23,000 on MacBook Pro. Limited period offer. This Offer valid all over India. Locate your nearest reseller at www.apple.com/in/buy. Terms& Conditions Apply:Offer valid on MacBook Pro MD101HN/A. Offer cannot be clubbed with any other offer.Offer valid till stocks last. This model is also available on DGS&D. for Queries, Please email dgsndrc@icloud.com. TM and @2015 Apple inc. All rights Reserved.Please don't forget to say that, you found this offer in CityShopDeals.Com when you visit the store.